This bag features a zip close top with heat sealable header. The bag measures 5” by 8” with a 1.25” header with tear notch and a gusset (bottom) of 2.5”. The bags are constructed of 2 mil clear LLDPE (linear low-density polyethylene) laminated with 0.51 mil PVDC coated PET (polyethylene terephthalate). Bath Fizzies. Bath Bombs. Bubble Cakes. Bath Salt. Milk Bath. Bath Tea. Laundry Soap. Potpourri. 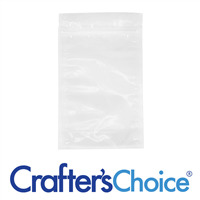 This clear zipper close bag features a heat sealable header with tear notch and a gusset bottom. Fill with desired product. Zip close with fingers. Heat seal the header above the tear notch with a heat sealer, iron or hair straightener. "So big, you can almost fit the kitchen sink!" COMMENTS: I use these for my bath salts and just recently discovered today, they are perfect packaging for my wax tarts and melts. I use my flat iron to seal them up. COMMENTS: These hold more than I thought they would. They're great bags and I can definitely find a different use for them! "Can these be recycled? What do I put on my labels regarding this? Thanks"
Staff Answer These bags are made of mylar. You would need to check with your local recycle center to see if this can be recycled. "which size bag would you recommend to hold 8 oz of palm oil (solid form). Thanks in advance." 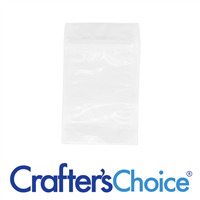 Staff Answer We do state this bag can hold approximately 2.5 to 3 cups of a powdered product. This bag would hold 8 oz. of palm oil. "How many ounces of bath salts would this hold? " Staff Answer If you look at the other Q & A's for this bag, we state you can fit 3 cups of a powdered laundry soap so depending on the size of the salt granule, you should get between 2.5 to 3 cups per bag. "Do these bags stand up?" Staff Answer Yes, this bag has a gusset bottom of 2.5" which would make it a self-standing bag. "I am looking for a bag that will comfortably contain 2.5 cups of powdered laundry soap. Will this be the correct size?" Staff Answer This will fit 2.5 cups very nicely and actually 3 cups would be about the maximum fill for this bag.